Dusseldorf, a city of Rhenish Prussia, capital of a district of the same name, at the confluence of the Dussel and the Rhine, 20 m. N. N. W. of Cologne; pop. in 1871, 69,351. Area of the district, 2,112 sq. m.; pop. 1,328,065. The city is a great focus of railway and steamboat communication, and much of the transit trade of the Rhine is carried on by its merchants. There are many carriage, tapestry, cotton, tobacco, and mustard manufactories, tanneries, and dyeing establishments. In 1288 Dussel-dorf became a municipality. In modern times it has been successively under the dominion of Brandenburg and Neuburg, under French and Bavarian rule, and was for some time the capital of the duchy of Berg, until in 1815 it passed with the whole duchy under the sway of Prussia. It is divided into four sections, the Altstadt, the Karlstadt, the Frie-drichstadt, and the Neustadt. The last was laid out by the elector palatine John William, whose statue adorns the market square and the palace yard. The Karlstadt derives its name from the elector Charles Theodore, its founder, who established in 1767 the academy of painting. The town possesses many delightful parks, and the Hofgarten is one of the finest in Prussia. New and beautiful streets have been laid out within the last 25 years. The prominent public buildings are the former electoral palace, now the art academy, the town hall, the cabinet of antiquities and that of scientific instruments, the tribunals, the observatory, and the churches of St. Lambert and St. Andrew. Both churches contain monuments of the ancient sovereign princes of Dusseldorf. There are numerous charitable and literary associations, an academy of commerce, a good theatre, and a library of 50,000 volumes. The celebrated picture gallery, established here in 1690, was transferred to Munich in 1805. The collection of 14,500 drawings by the old masters, among which are several by Michel An-gelo, Raphael, Giulio Romano, Domenichino, and Titian, and of 24,000 engravings and casts, which formed part of the same gallery, still remains in Dusseldorf. Art has flourished here more than in any other German town, especially since 1822, when Frederick William III. renovated the building of the academy, and when Cornelius, Schadow, and other artists of genius founded the Dusseldorf school of painters. The art union for Rhenish Prussia and Westphalia was founded here in 1828. 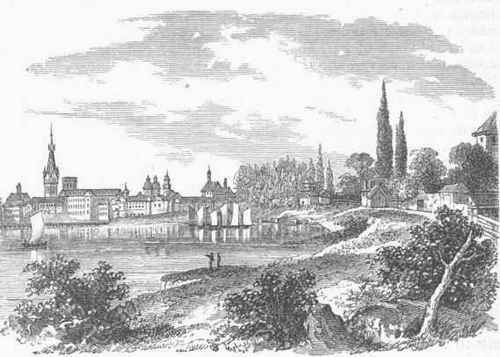 The engravers' establishment of the royal academy of Schulgen-Bettendorf was removed from Bonn to Dusseldorf in 1837. In June, July, and August there is an exhibition of pictures by living artists. Besides the academy of painting, there is a school for painters and one for architects. A monument of Cornelius for this city was designed in 1874.